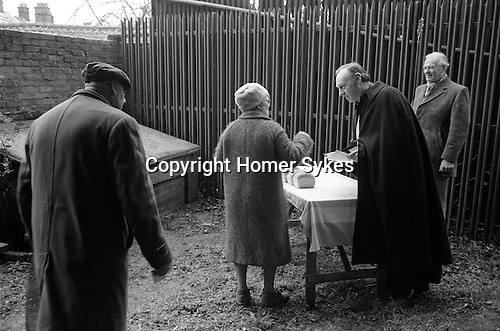 The Revd Canon Rowlands, accompanied by Churchwarden Mr George Thacker, distributes loafs of bread to those pensioners who qualify from a table set up in a back yard of the Bull Hotel. This is the site of Carlow's Tomb. Weep for me dear friend no more for I am gone a little before.But by a lite of pity prepare yourself to follow me. Good friends for Jesus sake forbear To move the dust entombed here. Blessed be he that spares these stones. Cursed be he that moves my bones. Twenty shillings worth of bread to be given on this stone to the poor of the town on the second of February forever. This inscription records the directive in his will that the rent from his premises (now covered by the new annex of the Bull Hotel) should go towards the upkeep of his tomb, and that every year on Candlemas day (2 February) the churchwardens from St Mary's should purchase twenty shillings worth of twopenny loaves from the two poorest bakers in the town, and give them to the poor of the parish. Moreover, this was to 'go on for ever'. At present, since loaves cost more than two pence, only twelve loaves are purchased and distributed by the rector of St Mary's the help of the verger and two churchwardens. Sherry is then taken in Carlow's room in the Bull Hotel by all those taking part.